French StarCraft 2 player, Ilyes 'Stephano' Satouri, has been suspended for his inappropriate behavior during a live match. It's been a poor week for professional gaming. First, a League of Legends player managed to net his team a $30k fine after he was caught screen watching during a competition. Now, professional StarCraft 2 player, Ilyes "Stephano" Satouri , has been suspended from his team without pay for one month, following a bizarre exchange during a live match in which he claims to have "abused" a 14-year-old. 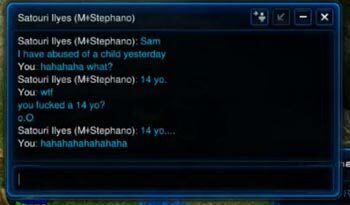 Now, English isn't 19-year-old Satouri's first language and it seems unlikely that even the most idiotic child molester would cop to his or her crimes during a livestreamed match of StarCraft 2, but Satouri's comments have landed him in hot water nonetheless. Evil Geniuses, the renowned pro gaming clan he represents, has since dropped him from its lineup for one month. "French Zerg player Ilyes 'Stephano' Satouri has been suspended without pay for the remainder of October, following his recent inappropriate comments," reads an Evil Geniuses statement. "He will be ineligible to participate in all online and offline competitions during the month of October, including the upcoming GD Invitational and DreamHack Bucharest tournaments for which he was previously signed up." Despite a public apology from Satouri, Evil Geniuses says that while the decision to suspend him is final, the team doesn't consider the matter closed just yet. As professional gaming grows in popularity and members of formerly niche communities become e-sports celebrities, we're seeing more and more examples of pro gamers acting inappropriately on the world stage. Earlier this year, competitive gamer, Aris Bakhtanians, brought the competitive fighting game community under scrutiny after a video of his appalling treatment of female gamer, Miranda "Super-Yan" Pakozdi hit the news. Bakhtanains later argued that "sexual harassment is a part of [the] culture," a statement he later retracted and apologized for.